You can view all your course assignments on the Assignments Index page. As an instructor, you can also add assignment groups, create an assignment, and modify assignment settings. You can also reorder assignments and assignment groups. Global settings include searching for assignments , adding a new assignment group , and adding a new assignment . 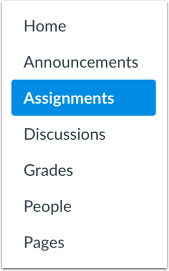 To weight the final grade with assignment groups, click the Options icon . When Multiple Grading Periods are enabled in a course, you can use the global settings to sort and filter the Assignments page by grading period. Assignments and assignment groups are validated against assignments in closed grading periods. The Assignments page displays all assignments in the course. Each assignment type displays an icon representing the assignment type: assignment , discussion , or quiz . Discussions and Quizzes also display within their respective index page in Canvas. If you are using the Quizzes.Next LTI in your course, the Assignments page also displays Quizzes.Next quizzes with the assignments icon . The Quiz icon indicates quizzes created with the classic Canvas quiz tool . Both quiz types can be used in the same course. Quizzes.Next assessments are created using the Add Quiz/Test button . For help with Quizzes.Next functionality, please see the Quizzes.Next chapter in the Instructor Guide. Each assignment displays the assignment name , due date (if any) , the number of points the assignment is worth , and assignment draft state status (published or unpublished) . If an assignment is associated with a module, the module name will appear on the individual line item of the assignment . To view an assignment, click the assignment name . You can also use the options drop-down menu to edit the assignment , duplicate the assignment , move the assignment , or delete the assignment . You can also manually reorder an assignment by hovering over the drag handle next to the assignment and dragging the assignment to the desired location. Note: If you are using Multiple Grading Periods, you cannot move assignments and quizzes that are part of a closed grading period to another assignment group. However, you can move open assignments and quizzes to another assignment group. If your institution has enabled a student information system (SIS) integration, you can tell if an assignment is set up to be sent to your institution's SIS. 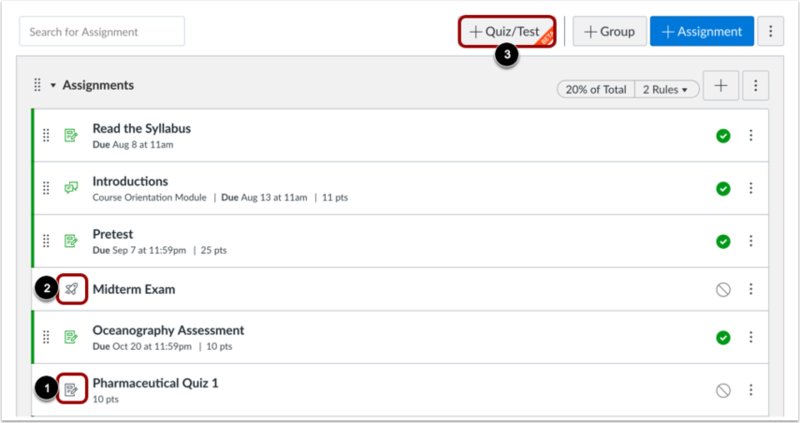 Graded assignments can be enabled directly by clicking the sync icon next to an assignment . Some SIS integrations such as PowerSchool allow you to import assignment groups. Imported groups include an import icon to identify them from manually created assignment groups in Canvas . Note: Some institutions may limit assignment names and/or require assignment due dates. If you try to enable an assignment and you receive an error message, the error will show which requirement needs to be resolved before the assignment can be enabled to be synced to your SIS. If you need to disable sync for all assignments in the course without managing them individually, you can disable sync for all assignments at one time. Click the Options menu  then select the Disable Sync to SIS link . All assignments will be updated and disabled from the SIS sync. Note: Disable Sync to SIS is not available in the Options menu unless at least one assignment is already enabled to be synced to the SIS. If you use MasteryPaths in your course, you can tell which items are set up in Modules as MasteryPaths or conditional content items. Pages allowed for MasteryPaths also display in the Assignments Index Page. If your course includes Blueprint icons, your course is associated with a blueprint course. Blueprint Courses are courses managed as a template and may contain locked objects managed by a Canvas admin, course designer, or other instructor. The Course Details tab in Course Settings will tell you if your course is a blueprint course. Most commonly, your course will not be a blueprint course and you can only manage unlocked content in your course. If your course is a blueprint course, you can lock and sync course content to associated courses. Previous Topic:How do I like a reply in a course announcement as an instructor? Next Topic:How do I use Draft State in Assignments? Table of Contents > Assignments > How do I use the Assignments Index Page?